I’ll confess that sometimes – not often – the drive home from the theatre is agonizing. Thinking about how to put into words my thoughts about a production or a performance can be difficult. I want to be positive, helpful, constructive . . .and usually that’s not a big deal. But sometimes its harder than others. I’m quite happy to report that the hardest thing about the trip home from Ensemble Theatre’s THE OTHER PLACE was deciding what to order at Taco Bell. (Two nacho cheese Dorito Taco supremes, hold the tomato for the record). This should be an easy review to write; it’s easily the best show I’ve seen so far in 2015. 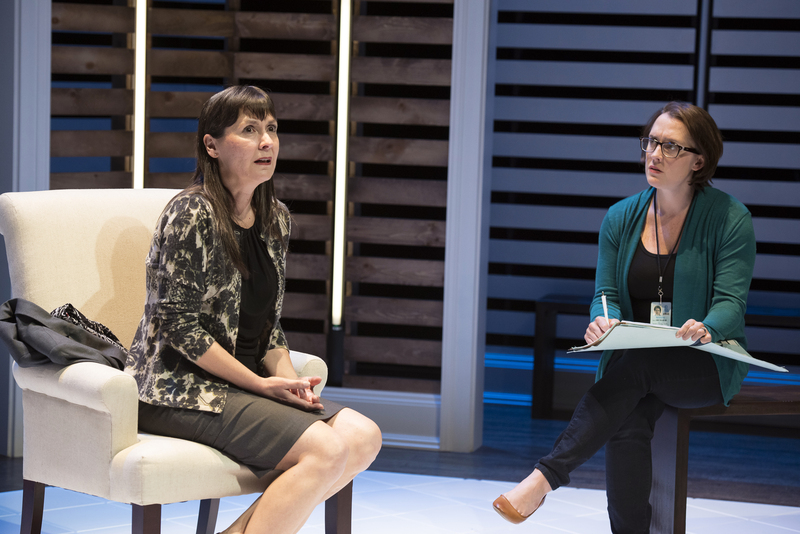 THE OTHER PLACE makes its regional premiere at Ensemble Theatre and features four or our cities best actors. Regina Pugh plays “Juliana,” a woman who isn’t as put together as she seems. Michael Bath is her long-suffering husband, “Ian.” Billy Chace plays a variety of characters as does arguably the most versatile actress in town, Kelly Mengelkoch. But this isn’t a family drama, necessarily. It’s part fantasy, part mystery, part mellow-drama, part science, and more. Director D. Lynn Meyers has a real knack for casting the right folks and often times just getting out of their way. This time, though, the direction feels tight, specific, and measured. I appreciate what an experienced crew of actors can do aided by such a steady hand. What is it they do? In this case, they create emotional magic. The energy in some of these scenes is palpable. I won’t reveal any spoilers; you need to see the show to discover the wonderful and heart breaking surprises for yourself. I will say that there is a scene in which Pugh and Mengelkoch share a moment so touching, it caused me nearly to sob. I marvel at the acting but also forgot that they were doing so. It felt that real. This is not a perfect show. The script could use some tightening, though it is inventive, ironic, and very funny. It takes a few minutes for the show to get going. I had a few issues of not understanding or hearing the male actors very well, as they seemed to be rushing through a few times. But overall, this is a mesmerizing play with an astounding performance by Ms. Pugh. Even her cast mates gave her all the credit as I spoke with them after the show. Of course, the set and lighting is amazing. Brian Mehring is so good I almost feel silly pointing it out. I’d like him to come design my home and my office. Chad Phillips’ costumes fit the contemporary mood; the women’s hair is important in distinguishing time and age, but not overdone. I enjoyed the sound design by Fitz Patton very much. This is a very good play, produced with brilliance by the performers, directors, and crew. I can’t recommend it enough, though be advised there is adult language and mature content. THE OTHER PLACE runs through February 15th at Ensemble Theatre in Over the Rhine. Tickets and more information can be found here.